. Published on November 28, 2017 . 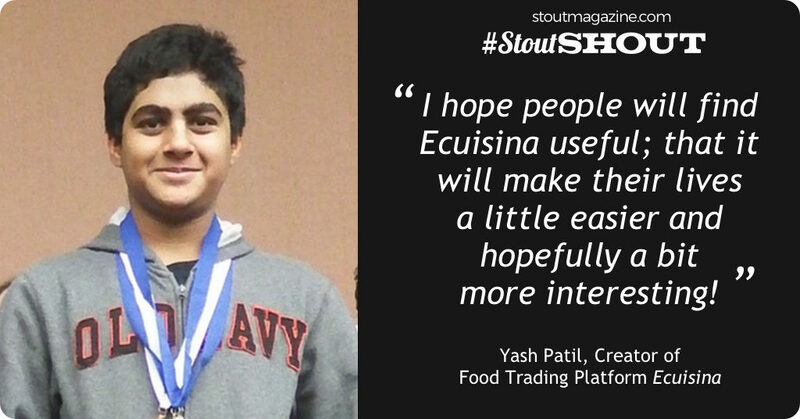 Stout Magazine gives young innovator Yash Patil a #StoutSHOUT for the creation of his startup food trading network, Ecuisina. When asked what “what did you do this summer?”, our featured young innovator has more than just vacation memories to talk about. Inspired by his father’s childhood cuisine sharing experience and his family’s love of food, Yash Patil took his interest in computer science, engineering, and business to the next level with the creation of his startup food trading network, Ecuisina. Yash, a freshman at Austin ISD’s Liberal Arts and Science Academy, talked with Stout Magazine about the story behind Ecuisina, what it took to get an innovative idea from inspiration to execution, and what’s next on the horizon for him (besides graduating from high school!). STOUT Magazine: So what was the inspiration for Ecuisina? What led you in that direction? Yash: My whole family loves food. My dad originally gave me the idea for Ecuisina – when he was a child, every evening his mother would give him a bit of the family’s dinner to exchange with his neighbors. Because of that, even though he lived in a village in rural India, he was able to try all sorts of unique foods and recipes. That got me thinking that I wanted to try building a food trading platform. It’s all about sharing and community. STOUT Magazine: So how did you go about making this idea into a reality from the ground up? Did it work right away? Yash: The great thing about building websites is that there is practically nothing in your way. All you really need is a computer and internet connection. So, I decided to just start one day and build it one step at a time. It took quite a while (I ended up having to rewrite the site several times), but I learned a lot in the process. 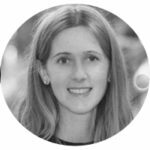 While creating Ecuisina, I learned a lot about building software – I got to work on and think about all aspects of a product, from user management to security to frontend logic. Persistence pays. STOUT Magazine: Building and refining are often part of the innovative process. What’s next for Ecuisina? Yash: I hope many people find Ecuisina useful and see it as a way to make their lives a little bit easier (and hopefully more interesting). I plan to continue refining the product so that it’s quick and intuitive to use. Additionally, I plan on allowing people to buy and sell food as well as barter it. Try interesting things and hopefully solve problems that matter. My father is an electrical engineer who works at ARM, where he designs computer chips for phones and other consumer devices. My mother is a pediatrician and runs her own practice, “Southwest Pediatrics”. My brother is a sophomore in college at UT Austin, within the Turing Scholars program. He is the one who got me into computer science. I have a dog named Charlie – he’s about a one and a half years old. He’s extremely quick and energetic and loves to run. I also own a rabbit – we’ve had him for about 2 years. Obviously, I invest a lot of my time into programming and computer science. 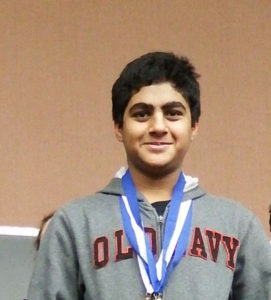 I also spend a lot of my time on Science Olympiad, and extracurricular that spans a variety of different science topics – including academic, lab, and engineering events. I typically do engineering events as I like to build and tinker. Nobody in particular, but I think Elon Musk is doing some cool stuff. Who would you most like to meet (top 5)? What is your biggest obstacle right now? My biggest obstacle is not having enough time to work on things that I want to do. How do you goal set? I don’t have a strict goal-setting plan – I usually just decide what I want to finish by the end of the week, and work as hard as I can to do so. What really fuels me and makes me love programming is the ability to write just a few lines of code and see an immediate result, and in particular, one that I can refine. What do you most admire in others? Their ability plan things out once and produce high-quality work. What do you wish you had more of? I wish I had more time to create things that I want to, and work on lots of different projects. What are people most likely to find you doing every day? Just start working on something. Don’t think too much about whether you’re doing the right thing or doing it in the perfect way. What’s your power word or motto? Ecuisina will be taking interns starting Spring 2018. It’s never too early to develop your innovative instincts. For more advice on strengthening your skills, check out Stout’s article on determining your innovative pathway. And for a different perspective, learn what Austin Mayor Steve Adler has to say about the challenges of leading an innovative city.